If you’re heading to the most magical place on Earth and wondering how to stay cool at Disney World, don’t worry because I have a lifetime of experience trying not to be scorched by the sun while at Disney World. 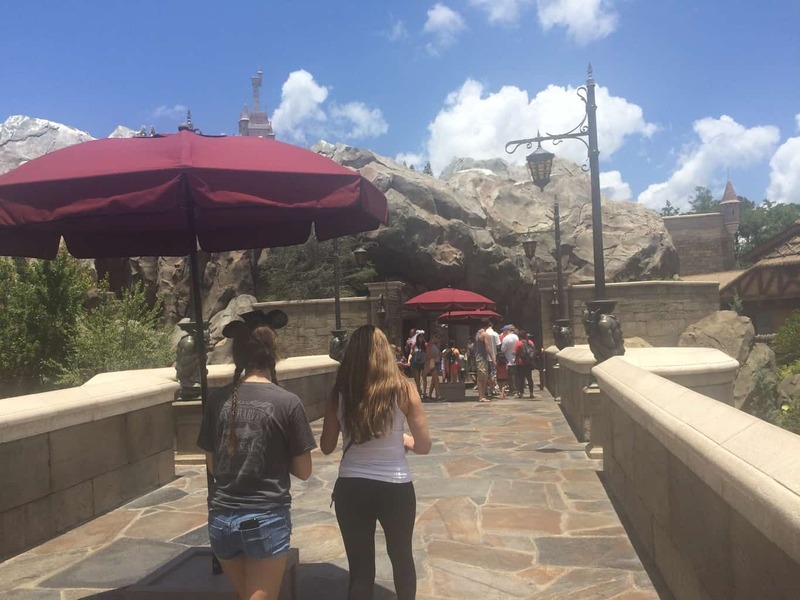 As a Floridian, I’m used to trying to beat the heat at Disney World and I’m happy to show you how to do the same – it is possible, I promise! I have a bit of bad news if you’re trying to choose the coldest month at Disney World, because, um, hello, it’s Florida. I have worn shorts and a T-shirt in the depths of January and needed to take a break in the shade because I was about to have a heat stroke. Sure, there are some months at Disney World that are cooler than others. Just like the rest of America, Florida operates on a “winter is in December, January, and February” schedule and so if you visit during the winter months, you have the most chance at keeping cool. It’s just that Florida is also much further south than most of the US and so what’s “cold” in Florida is like a warm Spring day in most of the country. I also appreciate that many people don’t have a choice when it comes to the month they visit Disney World. Maybe you’re bound by work schedules, school schedules, or discounted months and you need to travel when it’s hot. 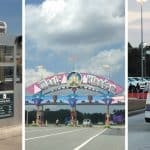 For the purpose of this post, I’m going to assume you’re visiting Disney World in the summer (June, July, or August), but the tips still go for any time of the year when it gets hot at Disney World. As a Floridian, you grow up learning that the things you wear to Disney World have a huge effect on how hot or cold you are. But just because you know to not wearing your warmest winter parka is August doesn’t mean that visitors necessarily understand all that goes into staying cool in Disney World when you’re battling off the charts heat and humidity. So to help you out, here are some tips on staying cool at Disney World based on what clothes you do (or don’t) put on your body. Part of the name of the game of staying cool while at Disney is to wear as little fabric as possible. You do need a shirt, shoes, and some type of shorts to get in – no going in your bathing suit allowed, but beyond that I’m really advise you to skip the long sleeve shirts and the jeans in favor of shorts and T-shirts (or tank tops). At the end of the day, the point is to make it through the day while having a fun time and not melting in a pool of your own sweat, so I don’t really care that everyone in your home city wears long pants even in the heat of the summer (London, I’m looking at you) – this is Disney World, the dress code is casual, and you should make sure to bring lots of shorts and T-shirts with you. One of the things you might not know about the actual fabrics you should wear to Disney World in the summer is that cotton isn’t always the best option. You want something that’s moisture wicking and lightweight – this means shirts like these for women, shirts like these for men, and some type of linen or lightweight shorts for the ladies. You don’t need or want to be wearing your thickest denim, even if the actual cut of the clothing is short. Some of this can seem obvious if you have a hot summer where you live, but trust me when I say that once you factor in the insane humidity, summer in Florida is just different and will make you feel like you’ve just stepped out of the shower as soon as you step outside and are dripping from every part of your body. Rock the wide-brimmed hat at Disney to keep the sun off your neck, ears, and face. 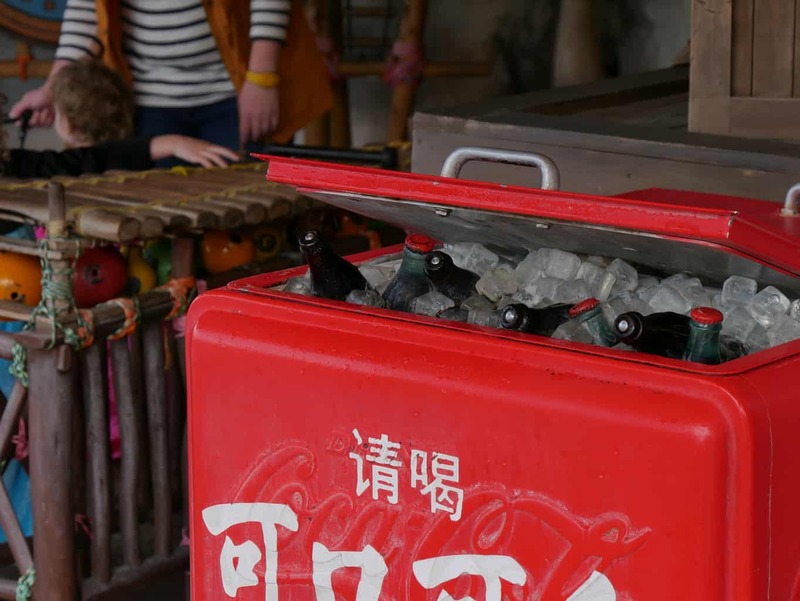 This is an essential part of keeping cool at Disney World, especially for small children. Buy them a floppy hat like this one, or stick everyone in your family in matching baseball hats to at least do a bit towards keep the sun out of your face. Your goal is to be as sheltered as possible while walking around in the open or waiting hours for the parade to start. While ultimately the coolest footwear would be a type of sandal, they’re not meant for everyone going to Disney World as you do need to make sure that they are comfortable walking miles in all day around and around. Even if you don’t wear sandals, do consider a shoe that has some breathability to it. You won’t need your heaviest winter boots or athletic shoes meant to keep your feet warm. Something breathable like this is a good option, as well as a more comfortable type of flat like these. I don’t actually know if this is just a Florida truth or an actual truth, but darker colors are said to heat up more than lighter ones. This means that you should be wearing white or light colored shirts rather than your black ones. Sure, it might not feel like it makes a huge difference in the moment, but after a day of being in the sun at Disney World, I think any little thing you can do to help is important. If you don’t want to wear shorts, but do want to keep cool, consider skirts or dresses that let everything breathe and perhaps get you a little bit of a breeze going on past your legs. I would recommend a skirt like this, or a summertime dress like this. You don’t need to be wearing your heaviest cargo shorts – just because it’s technically short doesn’t mean it’s the best choice for beating the heat at Disney World. Opt for a lightweight athletic short if possible, or more of a linen or lightweight fabric instead of your cargo pants with 27 pockets that are just making you sweat. 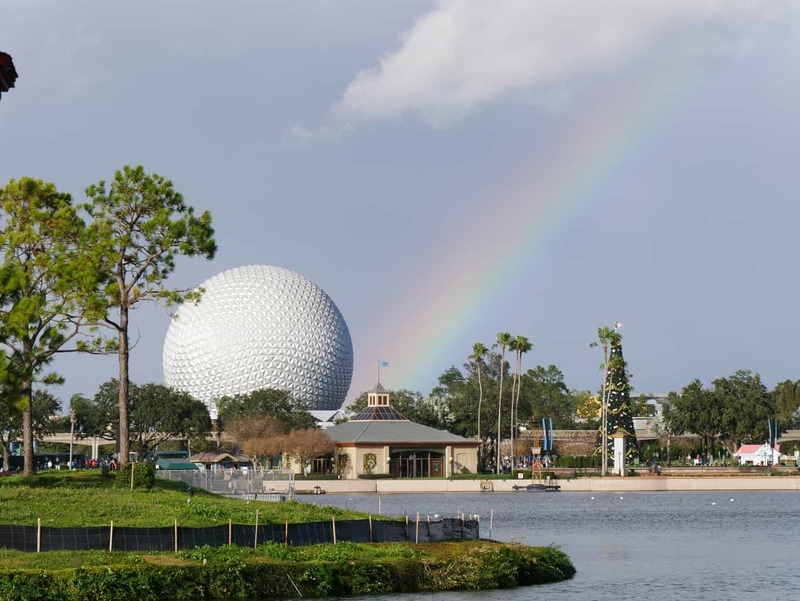 After you’re all dressed and ready for your summer trip to Disney, you should consider things to bring with you to Disney World to keep cool – some you’ve probably thought about, others not so much! Please, for the love of all that is good in the world, don’t travel to Disney World without sunglasses. Even in the summer when you’re going to get massive rainstorms, there will still be a lot of sunshine and keeping your eyes sheltered from the sun is just another way to deal with the summertime temperatures. 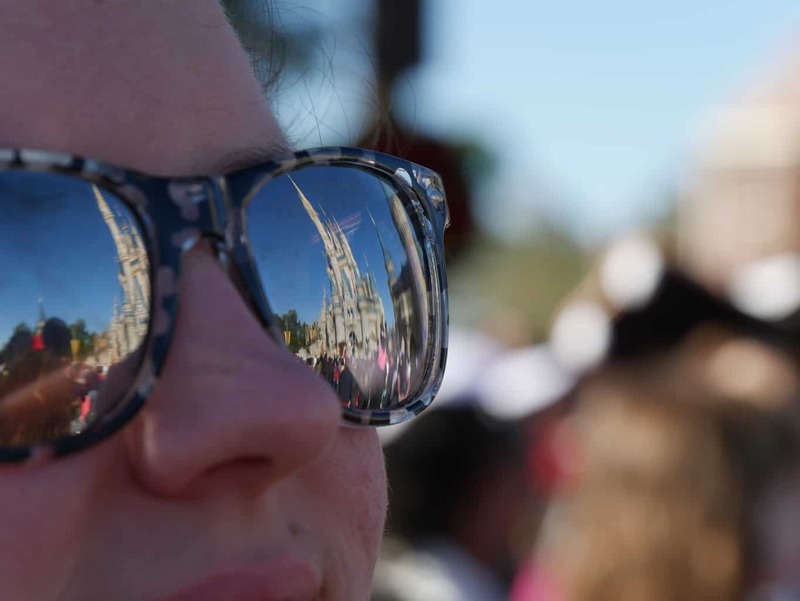 Make sure to get sunglasses like these with appropriate UV protection, or deck the kids out in these adorable Mickey glasses that will get you lots of smiles from the Mouse himself. If you’ve never thought of bringing a cooling towel to Disney World, your mind is about to be blown. There are a couple different brands of cooling towels, but the idea is that you can wet it, wring it out, and then it becomes cool when draped around your neck or touching your skin. Then, as the water evaporates, it dries up and can be folded or packed away. I would highly recommend cooling towels for everyone in the family on your Disney trip, as we use these kind and find them super helpful and they go a long way towards making sure we don’t murder each other out of heat exhaustion by the end of the night. I would not, however, recommend bringing a regular towel and wetting it. You need something that can dry quickly, not just carrying around wet washcloths all day. Is it a mister? Is it a fan? It’s both, and while it may seem very 1999, misting fans are still a popular way to stay cool when traveling to Disney World and I think you should embrace it. Get everyone their own individual misting fan to wear around their neck like this one, or get one for the family that you can pass around when you’re waiting for the fireworks to start and can no longer feel your skin through the beads of sweat forming on it. Just watch out for other people and don’t automatically assume other guests want to be sprayed! Part of beating the heat at Disney World is keeping cool internally. You can get dehydrated super fast when you’re so busy having a good time that you forget to drink up, so make sure everyone has their reusable water bottle packed for the day out. You can get a filtered one like this if you don’t like the taste of Florida tap water (it does taste a bit…odd, if you’re not used to it), or you can opt for a Disney themed one like this if you can’t bear to bring anything with you that isn’t themed. Alternately, consider one like this which will help you track how much water you have consumed during the day – a sure way to make sure you’re actually drinking enough. Lather up the sunscreen, people! And not just once in the morning, but over and over again. Keeping sunscreen topped up is an important part of surviving Disney World in the summer, and a real requirement for your health and overall wellbeing. The Florida sun is harsh and can be damaging – don’t let yourself be one of those people walking around like a boiled lobster because you were too cool for sunscreen. Oh, and another thing about sunscreen – while you want to make sure you get ones with the proper SPF, did you know that some sunscreens are really environmentally damaging and bleaching our coral reefs? You won’t be swimming in a coral reef at Disney World, but you should check out this sunscreen as one to keep on hand as a better option for the Earth. So you’re at the park entrance, ready to rock and roll, it’s 8am and like 105 degrees outside with 86 degrees humidity, but you’ve got on your linen shorts, white shirt, Disney hat, UV protection sunglasses, and 100 SPF sunscreen. What do you do once you’re actually at Disney World to stay out of the sun or beat the heat even further? You can get free ice water from any quick service location by simply asking. You don’t have to order anything else, you can just ask for cups of ice water and you will be given cups of tap water happily. This is great for if your water bottles are left at home, if you’re having a quick service meal anyway and just want to hydrate, or if you sense signs of being overwhelmed by the heat by anyone in your family. Don’t be afraid to do this – Disney cast members are more than happy to help you out so that you can keep enjoying the parks and this is a very normal and common thing. Some people enjoy planning table service meals for lunch, which gives them a couple of hours to sit down in an air conditioned building and enjoy their lunch during the hottest hours of the day. This is an excellent strategy if you’re already planning on having a sit down meal anyway, or if you weren’t sure whether you should or not but know that you’re going to struggle in the heat. You should also make sure that you do book somewhere where you will get plenty of breeze and air conditioning – sitting outside at the Rose and Crown for lunch, for instance, is probably not the best choice! 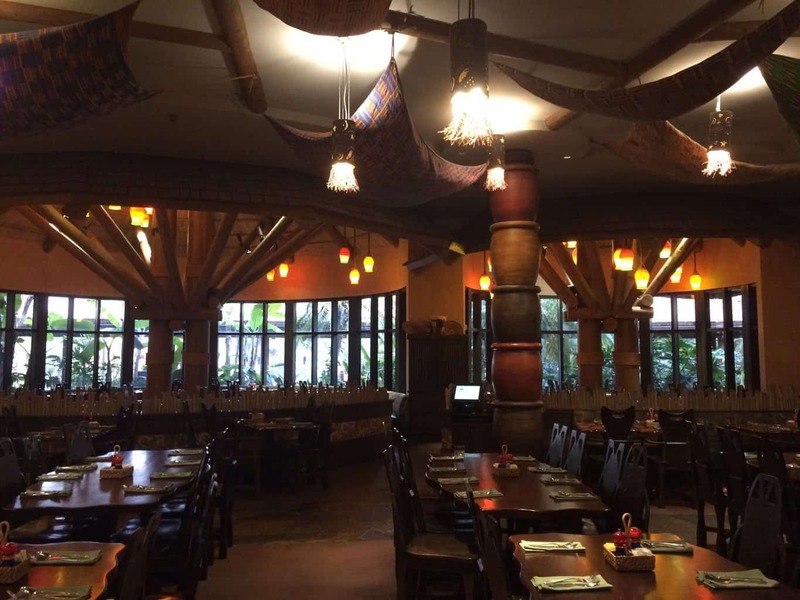 But a lunch at Tusker House at Animal Kingdom at noon or 1pm? Excellent! 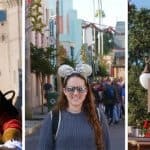 When it comes to choosing Fastpasses, I’ve got some guides on the best Fastpassess to get for each park such as the best Fastpasses for Magic Kingdom and best rides to Fastpass at Animal Kingdom, but when it comes to Disney in the summer, you should take something else into account in addition to my recommendations: the sun. There are some rides, like Space Mountain, that have almost an entirely indoor queue. Others, like Thunder Mountain, can be in the sun a lot or at least exposed to the heat. When choosing Fastpasses for rides, choose to Fastpass the ones with lines that are mostly in the sun, while opting to wait in the standby line for rides with shaded or air conditioned areas. Luckily, Disney has factored the heat into many of its ride queues, but it’s worth doing a check beforehand to make sure you’re not just Fastpassing the rides with the air conditioning! 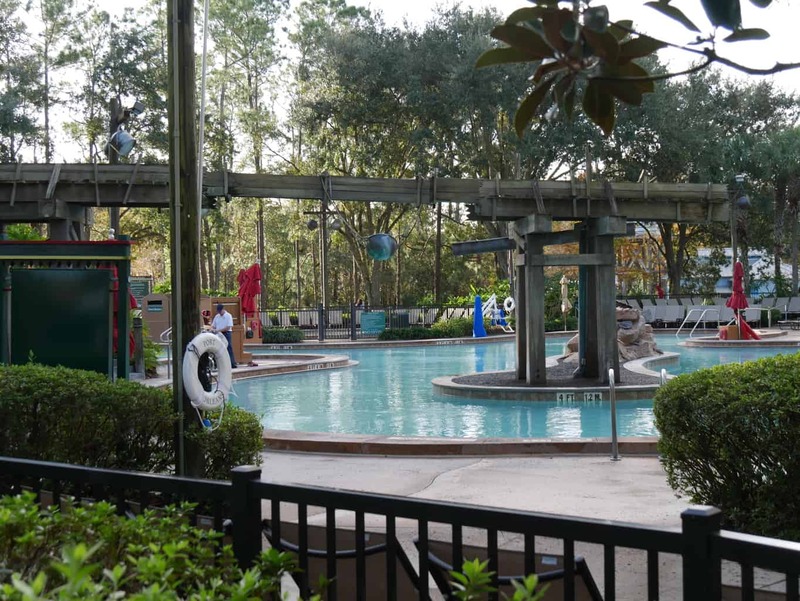 If you’re staying at a Disney resort, many families stay cool at Disney World by going back to the resort for a swim mid-day. This schedule would mean that you get to the park for Rope Drop (park opening), leave about lunchtime, swim for a couple of hours or simply enjoy indoor activities at your resort, and then come back early evening to finish out the day at that park. When you plan your summer Disney trip, you should take this into account when choosing a resort as well. 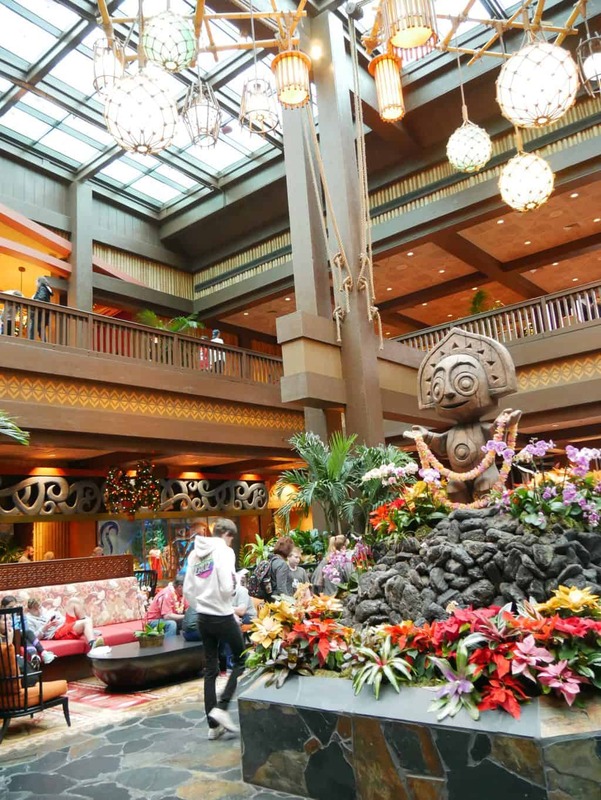 For instance, it may be worth paying more to stay at the Polynesian, which is a bus or monorail ride from the Magic Kingdom, if you have a family who loves the Magic Kingdom. Equally, why not consider an Epcot area resort like the Beach Club if you are Epcot or Hollywood Studios fans? The easier it is to get back to your resort for a break, the more likely you are to take advantage of it. When planning your itinerary in each park, consider saving some of the walk-on shows or indoor experiences for the middle of the day. This way, you’ll have a chance to sit down and regroup while still feeling like you’re not wasting any time at the parks. This isn’t to say that it won’t be hot in the morning or evening, but typically the afternoon is always going to be the absolute hottest, so why not work with Mother Nature instead of against her? 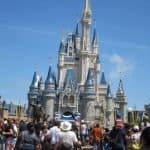 There can be a lot of pressure to enjoy your Disney World trip to the point that you disregard all of these tips about beating the heat at Disney World and simply think you can handle it. You might be able to, of course. But you also could find yourself in a dangerous medical situation if you’re overheated, dehydrated, sunburned and walking around theme parks all day. The Florida sun can truly be much more intense than you are used to, so know your limits and be honest with yourself and your family about how you’re feeling. At the end of the day, it’s better to take a couple of 20 minute breaks throughout the day then to waste half of it in the hospital with heat exhaustion or feeling completely out of it and not paying attention to any of the magic around you. 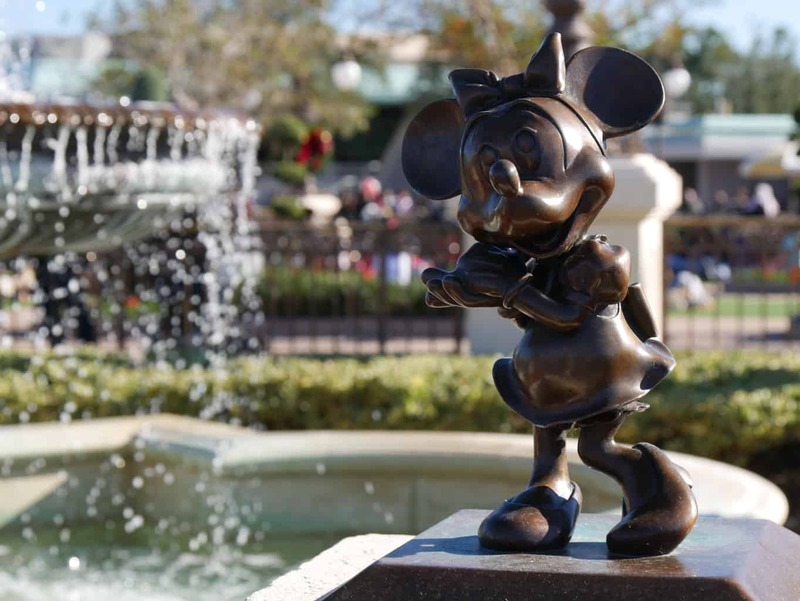 What are your top tips for staying cool at Disney World?